We all have a thorough knowledge of traditional materials and historical design as this is the basis of all our work. 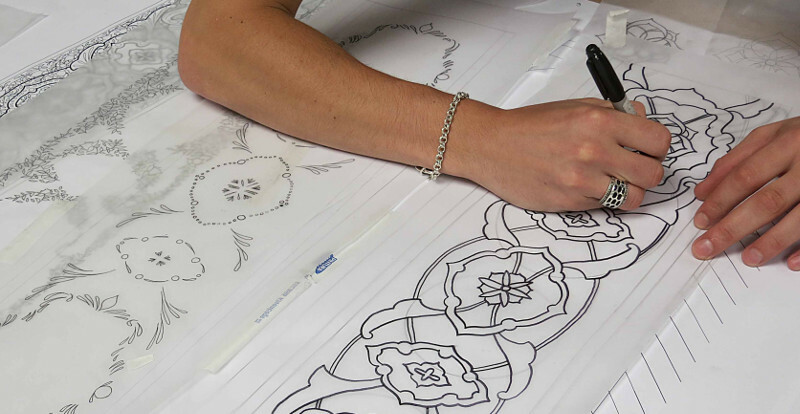 Hand drawing skills, combined with our use of computer technology, means we are able to produce complex designs with precision, and respond to any challenge presented to us. We are equally happy to develop a scheme for a house, particular room or piece of furniture, working with fabrics or architectural references already researched by clients or creating a new design to fit our customers individual requirements. We have extensive CAD drawing facilities and our 3 CAD draughtsman can handle any project. Large format scanners and printers allow us to print long lengths on a variety of materials with superb colour and black & white capability.